What? Another blog post in less than a couple of weeks? Shocking, I know! Last Monday I dragged Rob to Snoqualmie Falls for the first time. Ever since I started re-watching Twin Peaks and saw the waterfalls in the credits, I’ve been wanting to go see it. It really is majestic. We went in July, one of our driest months, yet it was still gorgeous. Unfortunately the trail down to the bottom of the waterfalls is closed until Autumn, so we didn’t get to hike there. However, it does give us an excuse to go back. Instead I dragged Rob hiking this one trail which is supposed to give a unique view of the falls and nearby Salish Lodge. It was a flat easy, 3.6 mile round trip trail, which alas, might have been impressive at one time, but the trees are now so tall it’s next to impossible to glimpse the waterfall from that location. Not a very good start to my Seattle hiking book recommendations, that’s for sure! It was still a nice day. We picked up a basket of cherries for a buck, and hung out by the Snoqualmie River. I’d definitely like to go back there and paddle the river on a nice, calm day. I can’t believe this is really the first time we’ve explored east of Bellevue. So much for being a travel writer! Monday was the anniversary of us bringing Jory home twelve years ago. His birthday, so to speak. There was much remembering. We don’t have any pictures from the first day (a huge mistake on our part) but we did find his old paperwork from the Pikes Peak Humane Society. It’s still hard to believe that one dog could make such a huge impact on our lives. I had thought that losing Jory was surely the darkest timeline, but when I think of how close we came to not seeing him at the shelter, not having him in our lives would be the darkest timeline of all. Not much new to report on the writing front. There are a few things in the works. Right now Rob is reviewing the novel for the first time. I’m a little nervous about him reading this particular story. I hope overall he likes it. I have some potentially cool news, but I can’t reveal it just yet. I can say that it is pretty exciting for me, especially being the scifi fan I am. Wow, is it the middle of April already? When did that happen. The weather is teasing me with warm dry days, even though I know it won’t last. Still it’s nice to explore the neighbourhood on foot, in a light jacket instead of being bundled up, head down, racing from storefront to car. Rob and I celebrated our 16 year anniversary a few days ago. Sixteen years of knowing each other. Yikes. That’s a long time. We’re still best friends, we still miss each other like crazy when he’s out of town. I like that. We’ve had our ups and downs. Losing Jory being a major one, but we deal with it together. I’ve been quite the busy beaver these past few weeks. Most of it I can’t share with you just yet, not until it comes into fruition. But some of it I can. A few days ago I got to interview Bill Mumy for Inter-Galaxy Portal. He’s the star of Babylon 5 and Lost in Space. I was a huge Babylon 5 fan, so when my friend Ron told me he was doing the art for a comic book by Bill Mumy, well, you can imagine how excited I was about it. I’m loving getting these opportunities to do interviews. It’s funny, because the celebrity interviews are really cool and get me the most hits. But I also really like doing ones for people like Bill Clark, who created a steampunk card game, because I know that might actually be helping someone just like me. Anyway, so that’s big news number one. Big news number two is that the prologue for Shatterer of Worlds the audiobook is finally out. It look longer than I wanted it to. I’ve got to stop being so picky. I’ve been doing voice over for a while, but audiobooks are hard work. So of course it’s the area of voice over I most want to work in. Call me a glutton for punishment! Anyway, the prologue is here. Chapter two should be online next Wednesday! And that’s about all I can share with you. I have the mystery novel, but I’m still working on that. I have other things that may or may not be in the works, but I don’t want to jinx anything. Oh wait, there is one last thing I can show you guys! I have a new cover for The Huntsman’s Tale. I really like it. It’s not up yet, because I want to make a few tweaks to the text first but here it is, in all its glory. I won’t lie, 2012 was an unbelievably stressful year in the Arserio household. So when the idea of a vacation came up, we knew we wanted to go back to Hawaii. Sometimes, there’s nothing like going home again, and Oahu was home for a few years. It’s the perfect vacation. We didn’t need to run around seeing all the sites. Instead we could chill and do all the things we missed doing. And, for the most part, we got this vacation right. It wasn’t quite as chilled as I’d envisioned, but close enough. We returned to Oahu since we’d spent the bulk of our years on Hawaii on the gathering isle, and frankly Maui is a little too expensive for those last minute vacations. We even stayed in the town we lived in, Kailua. Ah, what to say of Kailua. If you ever visit Oahu and don’t want to stay in Waikiki or all the way on the North Shore, Kailua is the perfect option. Dreamy beaches, stunning views, and easy access to town. We stayed in Kailuana at a little B&B. The house was just a stone’s throw away from where the President spends his vacations (seriously, the owner rents out his house to the Navy Seals when the Obama’s are in town), but more importantly, it was just a stone’s throw away from where one of the heads of Pixar lives! It wasn’t a traditional B&B. No breakfast, but there’s a kitchenette and the hosts are very welcoming. We spent many an evening just hanging out with the owners, Doug and Bird, and their friends. The house sits on a canal that leads to the open water, and at night you can go down and see all the sea turtles sleeping in the canal. We counted 14, which is actually pretty low according to the owners. Still, we weren’t exactly complaining. 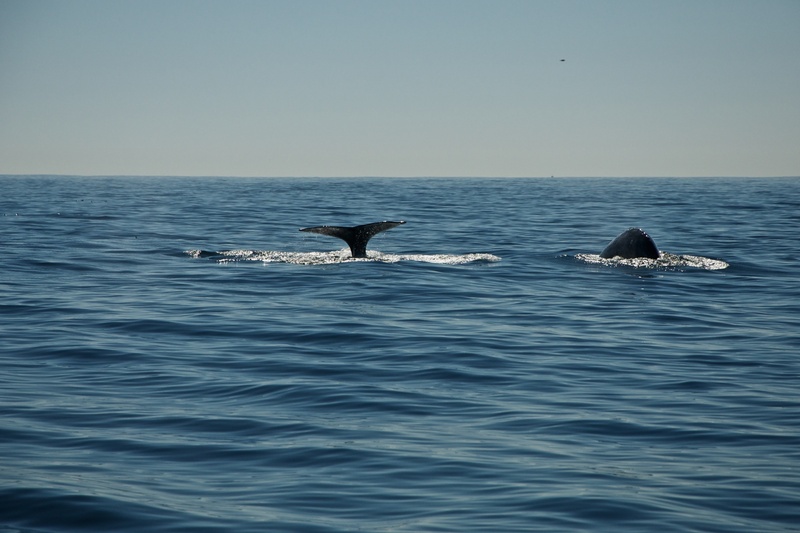 Our main hope was to do some whale watching from shore, and boy did we get lucky with that. On our first day, we visited a spot called Spitting Caves, and had two humpbacks pop up close to shore. We didn’t get to see them that close again, but we did get to see plenty of breaches and even watched a competition pod as they fought for the attention of female humpbacks. I miss whale watching. You can see whales from shore in Seattle, but it takes a bit more work. Being winter we had to chase the sunshine a little bit. It’s always a little rainier on the windward side of the island. So we took trips up the North Shore and spent a lot of time near Spitting Caves and Lanai Lookout, both of which are excellent for whale watching. We caught up with some old friends, which was nice. But what was really cool was realising the owner of Agnes, our favourite Portugese bake shop in Kailua, actually remembered us after four years away. Mmm, thinking of Agnes just makes me hungry for malasadas. If you’re on Oahu, definitely try Agnes or Leonards for malasadas, which are basically Portugese doughnuts. We also hit Waiola shave ice for the yummiest, finest shave ice on the island. Seriously, if anyone tells you that you have to go up to the North Shore to get good shave ice, don’t believe them, Waiola in Honolulu is where it’s at. We saw so much wildlife on this trip. Part of it is that we’re pretty lucky that way, part of it is we know to keep our eyes open. We saw whales, of course, monk seals which are very rare on Oahu, and of course the sea turtles. We also got to see some mongoose, but I never could get them to stay still long enough to get a picture. And we spotted a wild boar which was pretty cool since I’d never seen one before. We didn’t want to do a whole lot of “activities” per se. We’ve done places like the Arizona Memorial and Sea Life Park many times, so why bother. We did take a kayak out to the “Mokes” which is one of the bird islands located just off Kailua beach. And we did a sub scooter ride which was a unique experience. You ride around on this little scooter thing about ten feet under the water, with your head in a helmet. The only way I can describe it is like being in a fishbowl with the fish on the outside. It was different, and definitely worth doing, but having snorkeled and scuba’d in Maui, I would still say that that is hands down the better experience. Speaking of Maui, we’re already plotting a trip there next winter. I love both islands. We lived on both islands. But for whale watching and swimming with turtles, it can only be Maui. Not much to say in other news really. I had thought I might do some writing while on Oahu but I didn’t. What can I say, too busy taking sunrise strolls on the beach. I am excited to say that Shatterer book one is complete, and will be almost finished on the website in another couple of months. February I’m going to take a breather and work on something else, before working on getting Shatterer of Worlds published. Don’t know what I’ll be writing about except that it won’t be science fiction.